The heaviest lift for an industrial enterprise is data integration, the Achilles’ heel of the Industrial Internet of Things (IIoT). Companies are now recognizing the enormous challenge involved in supporting Big Data strategies that can handle the data that is generated by information systems, operational systems and the extensive networks of old and new sensors. To compound these issues, business leaders are expecting data to be captured, analyzed and used in a near real-time to optimize business processes, drive efficiency and improve profitability. However, integrating this vast amount of dissimilar data into a unified data strategy can be overwhelming for even the largest organizations. Download this white paper, by Bit Stew’s Mike Varney, to learn why a big data solution will not get the job done. 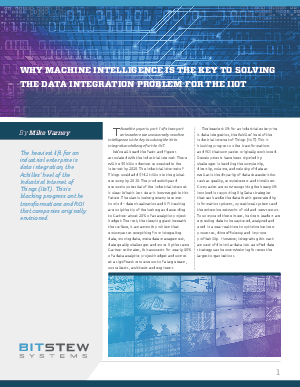 Learn how to leverage machine intelligence with a purpose-built IIoT platform to solve the data integration problem.